Mike Burton had a reputation on the field as an uncompromising prop for Gloucester and England who also toured with the British & Irish Lions. He was the first man to be sent of playing for England in 1975 and after retiring forged a successful business career in the field of corporate hospitality and event management. Burton made 360 appearances for Gloucester from his debut as an 18-year-old in 1964 until his retirement in 1978 as well as winning 17 England caps. At county level he won the then-prestigious county championship four times with Gloucestershire as well as twice winning the John Player Cup, at the time the club competition, with Gloucester. 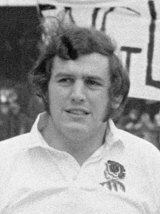 His England debut came against Wales at Twickenham in 1972 and tours to South Africa (1972), New Zealand (1973) and Australia (1975) followed. It was on the last of these that he was sent off in the second Test. The Battle of Brisbane started with punch-up between the packs before Burton was dismissed by local referee Bob Burnett following a late tackle on Wallabies' wing Doug Osborne in the fourth minute. The disciplinary hearing that followed ruled that no further punishment was necessary and Burton said: "You should have seen the things that were being done to us." In 1974 Burton toured South Africa as a member of Willie John McBride's invincible British Lions team. His autobiography Never Stay Down told of a tough upbringing in post war Britain and his single minded determination to succeed.